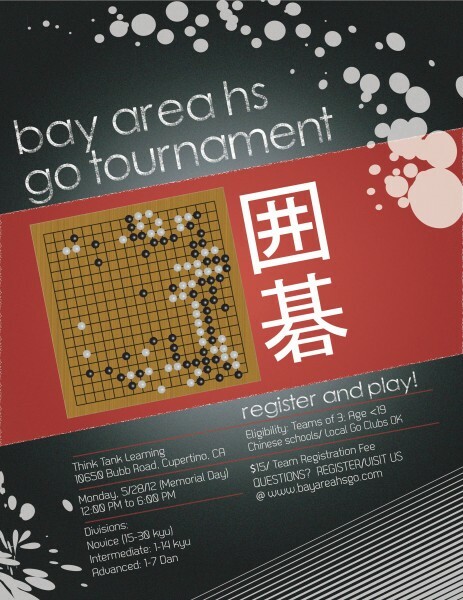 Bay Area k-12 schools are invited to compete in a half-day team contest in Cupertino, CA. Spectators are welcome, say organizers Kevin Huang and David Su, and competition should be strong among the local stars. Complete info is on the web here. The tourney will be held Monday May 28, (Memorial Day) from 12pm-6pm, at the ThinkTank Learning Center. Schools that register by Tuesday, May 1st get a reduced rate of $15, the fee is $18 after the 1st. Teams should contain three people. If a school has a shortage of players, players from different schools may register together as a team. The top 3 teams in each division will receive a prize, and participants will receive a team consolation prize. Click here to register. -Paul Barchilon, E-J Youth Editor. Photo: promo poster by Innod.net, double-click on the image for a full size blow-up. 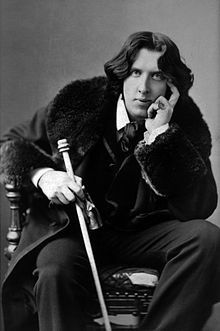 The Oscar Wilde Liberation Tournament NAIM/WMSG Qualifier is set for May 19-20 in the AGA Tournament Room on KGS. This second online tournament will afford players another chance to win points towards the North American Ing Masters (NAIM) Tournament and the upcoming 2012 World Mind Sports Games. The tournament is designed for 16 players, with four rounds over two days. Yixian Zhou will direct, and points will be awarded separately for players based on whether they are eligible for NAIM or WMSG points. Click here by Tuesday, May 15 to register. Click here for tournament schedule and details. 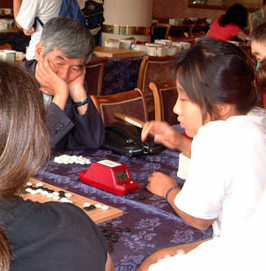 All players must be either eligible for the North American Ing Masters Tournament or the World Mind Sports Games, both scheduled for August 2012. The NAIM will be during the US Go Congress, August 4-12 in Black Mountain, NC, while the World Mind Sports Games will take place in Lille, France August 9-23. 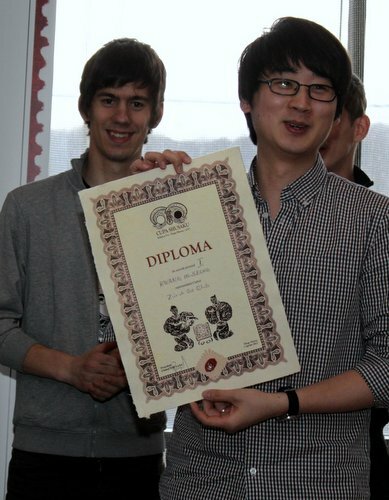 The second WMSG will be an all-amateur event this year, but further details of the tournaments have not yet been released (How to Earn Qualie Points for 2012 World Mind Sports Games in France article). Irish author and playwright Oscar Wilde (photo above) wrote many successful works including The Importance of Being Ernest and The Picture of Dorian Grey. May 19 marks the 115th anniversary of Wilde’s release from Reading Gaol Prison in 1897. 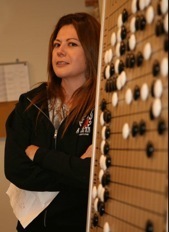 From a Q&A session with Hikaru no Go creator Hotta Yumi to presentations on the state of the art of supercomputer go, weiqi in Chinese poetry, and designing a college go course, more than 20 talks have now been scheduled for the 2012 International Go Symposium. Organizers have now closed their Call for Papers to the Symposium, which will be held at this year’s U.S. Go Congress, August 4-12 in Black Mountain, NC. Click here for the full list of presenters and topics; short abstracts will be posted soon. The Bistrita Spring Cup, played from 3/23-24 in Bistrita, Romania, was won by Denis Dobranis 4k (left), second came Daniel Haja 6k and third was Tudor Berende 5k. Result table. Croatia: The 445th Velika Gorica weekend-go-tournament, played on 3/31 in Velika Gorica, Croatia, was won by Robert Jovicic 2k, second came Mladen Smud 1k and third was Marko Ugarcina 6k. Result table . Austria: The Linzer Go Turnier 2012, played March3/24-25 in Linz, Austria, was won by Pavol Lisy 6d (photo), second came Lothar Spiegel 4d and third was Lukas Podpera 5d. Result table . Poland: The Warszawa, played on March 25 in Warszawa, Poland, was won by Arkadiusz Kindziuk 1d, second came Karol Cieslak 1d and third was Stefan Wroclawski 3k. Result table. The Netherlands: The 39e Keizer Karel Toernooi Zwitsers tournament, played from 3/17-18 in Nijmegen, Netherlands, was won by Paul Haanen 10k, second came Nicole de Beer 10k and third was Mark de Groot 10k. Result table. Italy: The Yama no Kaze 3 tournament, played from March 24-25 in Bassano del Grappa, Italy, was won by Carlo Metta 3d ( photo ), second came Viktor Bogdanov 4d and third was Alessandro Pace 2d. Result table . Germany: The Baduk Botschafter Cup/Gruppe 2 tournament, played from March 24-25 in Kassel, Germany, was won by Donald Eckart 4k, second came Karen Schomberg 3k ( photo ) and third was Thomas Gottstein 5k. Result table . The Baduk Botschafter Cup / Gruppe 1 was won byAndre Staedtler 3d ( photo ), second came Lukas Kraemer 5d and third was Jonas Welticke 4d. Result table . Calvin Sun won the 2012 Cotsen Open, sweeping all five rounds and earning an invitation to the AGA’s first-ever professional certification tournament, which will be held at the US Go Congress this summer in Black Mountain, NC. Runner-up Curtis Tang also collected an invite to the pro certification tournament. Click here for the tournament crosstab with links to top-board game records. Other top Cotsen winners in the Open section were Chun-hong Chen (3rd), Deuk Je Chang (4th), Daniel (Dae Hyuk) Ko (5th) and Joey Hung (6th). The Santa Monica Go Club won the team prize, collecting the $1,000 prize. Other winners: Section A: 1st: Sang-suk Kim; 2nd: Anthony Chen; 3rd: Gary Shen. Section B: 1st: Yunxuan Li; 2nd: Ho-byun Young; 3rd: Jeremy Chiu. Section C: 1st: Jinming Pan; 2nd: Michael Wanek; 3rd: Daniel Liu. Section D: 1st: Jack Cai; 2nd: April Ye; 3rd: Wait-to Char. Section E: 1st: Sang-chul Lee; 2nd: Sum Kim; 3rd: In-soo Hwang. Section F: 1st: Jiayue Li; 2nd: Gary Huang; 3rd: Yongqiang Chen. 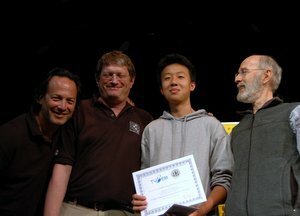 Section G: 1st: John Ye; 2nd: Hong L Bach; 3rd: Scott Nichols. photo: Cotsen winner Calvin Sun (2nd from right) with tournament sponsor Eric Cotsen (far left), AGA Board Chair Andy Okun (2nd from left) and AGA President Allan Abramson (far right). photo by Chris Garlock. For a guy whose nickname is “The God of War” and who has amassed over 1,000 career wins, Cho Hunhyun 9P in person in actually pretty mild- mannered. In Los Angeles this weekend to help launch the American Go Association’s (AGA) nascent professional certification system at the Cotsen Open AGA-Tygem Pro Prelim, Cho took a few minutes out of a jam-packed schedule Saturday at the Korean Cultural Center to sit down for an interview with the American Go E-Journal. 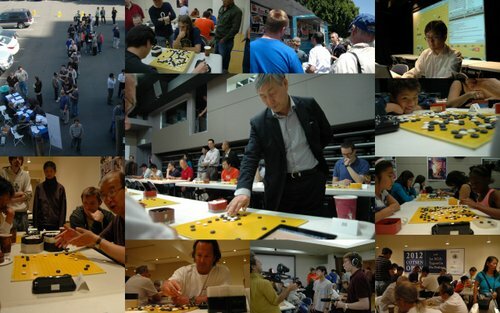 “This is a monumental moment for the AGA,” Cho said, “and I wanted to be here, on behalf of the Korean Baduk Association, to show our support.” Saying that he’s “very impressed” by the American effort and enthusiasm for go, Cho said that simply by launching the American pro system “You have taken the most important step.” But, like the game of go itself, Cho encouraged American players to settle in for a long road ahead. “China dominated this game for 5,000 years,Japan dominated it for 500 years and Korea has been on top for just 30 years, so for American players to compete on a world level, it’s going to take a long time, 10, 20, maybe even 50 years.” Developing a professional system is absolutely key to building the strength of American players, Cho said, because it creates the necessary financial incentives and infrastructure and ultimately will make it possible to have a career as an American professional go player. But because it’s impossible to predict the rise of homegrown go prodigies or geniuses, Cho said America must “just follow the path, be patient and put in the effort and someone will come forth.” This was Cho’s own path to the top, he said, saying that “choosing the path of a go professional was like destiny,” adding that he feels that “this journey has not ended” for him and he thinks he still has more to contribute to the game. “The beauty of go is that people become modest when they play.” As proof, Cho revealed that he’s recently taken up golf, where “I am now the amateur” and can just have fun playing. “The team competition was fierce” at the April 22 Carolina Spring Go Tournament, reports organizer Owen Chen. The team competition for youth players was one of the unique features of the annual tournament in Raleigh, NC, organized by the Cary Go Club and the Chinese-American Friendship Association of North Carolina. 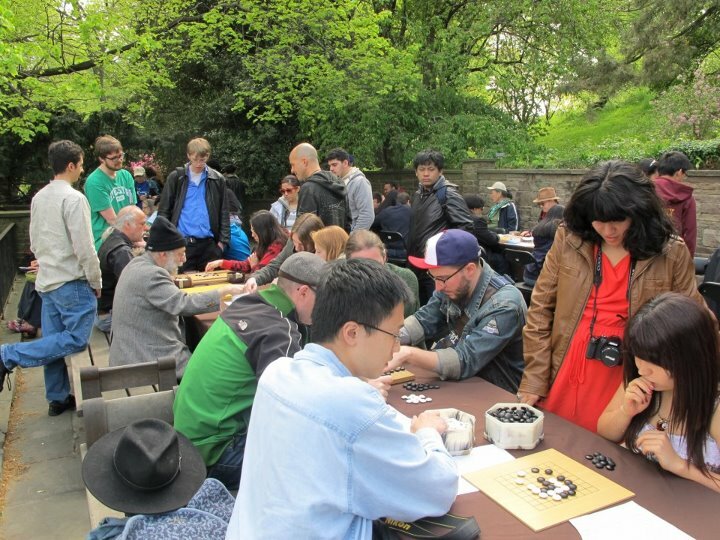 The event drew 34 go players ranging from 6 to 70 years old. Four teams representing the Raleigh Academy of Chinese Language (RACL), Cary Chinese School (CCS) and the Chinese School at Chapel Hill (CSCH) competed in the team tournament. “Young players kept reporting and checking the team scores posted on the wall after each round,” Chen tells the E-Journal. In the end, two teams from CCS - CCS Team 1, consisting of Alvin Chen, John Zhu and their teacher Jeff Kuang, and CCS Team 2, consisting of Byron Qi, Larry Zhang and David Hao, tied for the first place in the team competition with each team scoring 8 wins. In the individual competition, Chen himself, a 5-dan, won the open section. 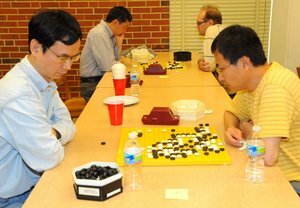 Jeff Kuang 5d and Guojun Zhu 4d tied for the second place of the open section, each with three wins. Brian Wu 1d won Section A (6k-1d) with a score of 3-1. Ralph Abbey 10k, Alvin Chen 12k and Jeff Martyn 10k all won 3 games and tied for the first place in Section B (15k-10k). In the beginner section of Section C (27k-19k), Byron Qi 20k, Anna Wiggins 19k and Larry Zhang 20k tied for the first place, each with 3 wins. Only three top players are undefeated after the first three rounds of the 2012 Cotsen Open: Curtis Tang, Calvin Sun and Chun-hong Chen. The final two rounds of the Cotsen will be held on Sunday, April 29 in Los Angeles, CA. Day One featured morning simuls with visiting Korean professionals, three rounds of tournament play, a lecture by Janice Kim 3P and broadcast of top boards on KGS, with pro commentary by Myung-wan Kim, Yilun Yang and Yoo Chang-hyuk. All the game records — including the pro commentaries — will be posted on the website soon. Two more professionals have been confirmed for this weekend’s Cotsen Open in Los Angeles, CA: Janice Kim 3P (at far right) and Kim Hyo-jung 2P (below at right). The American-born Janice Kim has long been a popular teacher at U.S. events, including the annual Go Congress, while Kim Hyo-jung is a well- known commentator and MC at Korean go events. 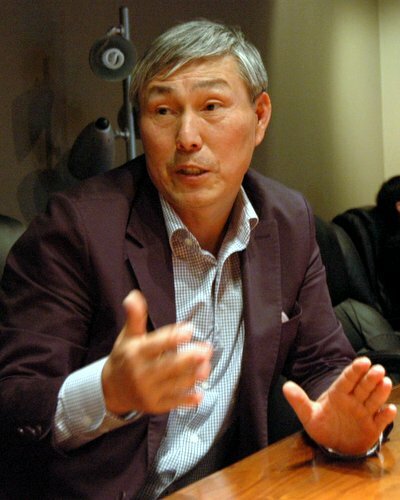 That will make an impressive total of seven pros at the Cotsen, including Cho Hun-hyun 9P, Yang Jae-ho 9P, Yoo Chang-hyuk 9P, Myung-wan Kim 9P and Yilun Yang 7P, all of whom are expected to play in simuls with Cotsen attendees as well as give lectures and game commentaries. Registration opens at 8a Saturday (walk-ins are welcome), Saturday, 4/28 at the Korean Cultural Center (5505 Wilshire Blvd.Los Angeles,CA); Round 1 is scheduled for 10a PST, Round 2 for 1P and Round 3 for 4:15P. Live EJ game broadcast of top-board games on KGS begins with Round 1 and live commentaries should begin around 11a PST. Watch the AGA website and keep an eye on KGS for updates throughout the weekend.